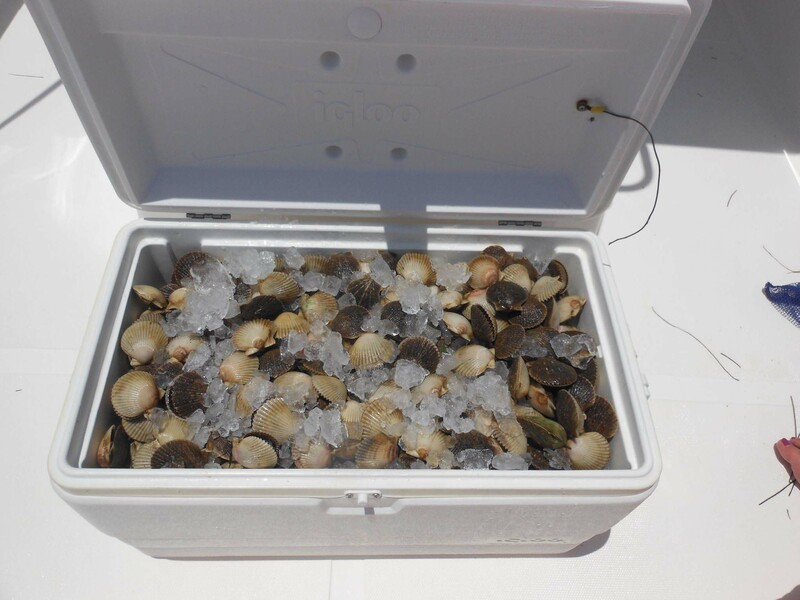 They’re heeere….scallops, of course. Things began with a bang. I made sure I was there the first day to take some pictures and give some hints for those of you planning early trips. 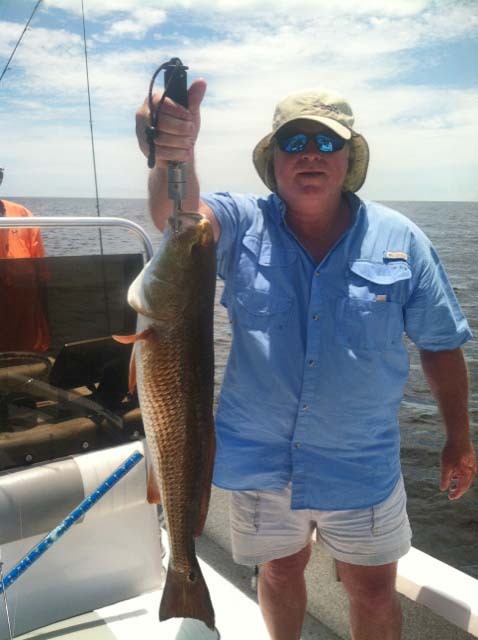 In spite of challenging water the past few years, the water north of the river was in excellent shape this year. 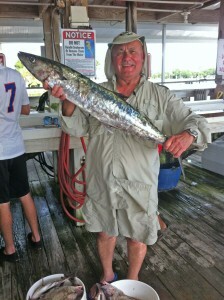 And it didn’t take long for the limits to start coming in when locations were established. After the first day of the season, currently the easiest limits are coming from north of the channel, near the Bird Rack (29 43.438’N 83 34.373’W). On lower tides the water is gin clear. 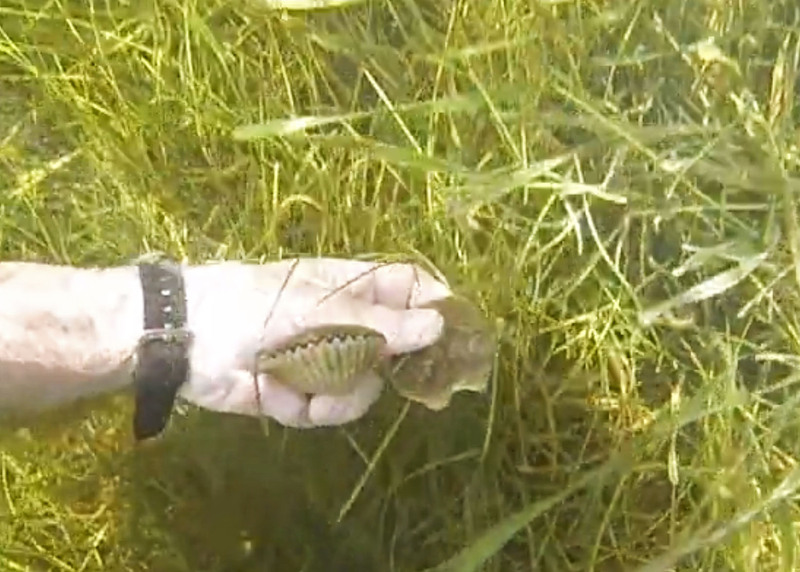 Scallops are being found in the needle grass, not the more common turtle grass, so as you are idling through the areas look for the thin wiry grass like in the picture below, especially in areas with sand. Limits really come quickly when you can locate scallops, and of course you will be able to locate the fleet of scallopers with no difficulty. Here are just a few pictures from opening day. 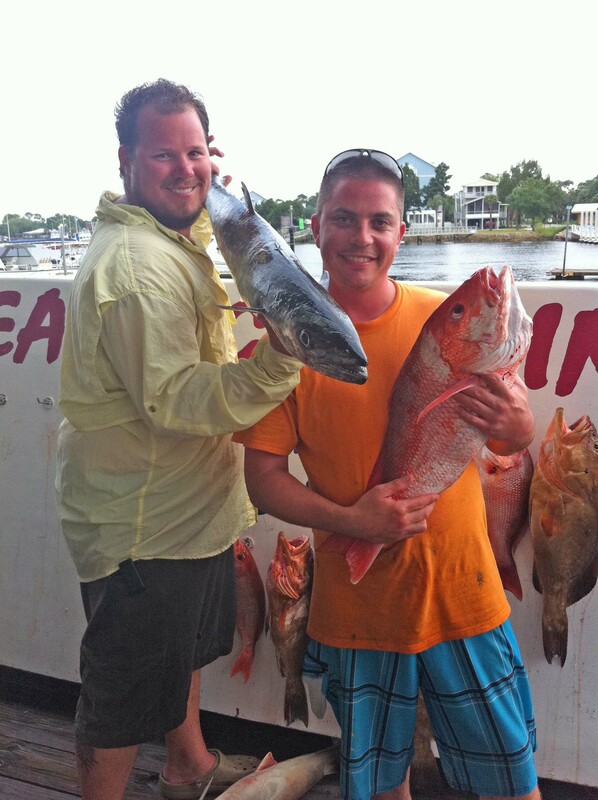 In terms of fishing, the offshore trips provided lots of red grouper action. 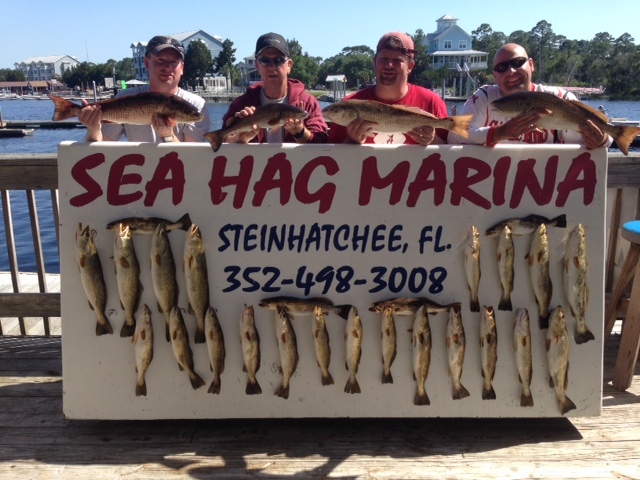 There were even some very nice gags being taken in state waters, which will be closed as of July 1….but federal waters will be open. Kingfish have been making a late arrival as have the large schools of whitebait and Spanish mackerel that travel with them. While amberjack are out of season for June and July, they’ve provided lots of action this month for offshore fishermen, and the irritatingly short 9 day red snapper season provided some excellent fish. Inshore, the redfish bite has been very good with both schools and solitary fish being taken in their usual locations near oyster bars and rockpiles. While it’s hard to classify it as a problem, we’ve actually had difficulty finding redfish small enough to be kept. 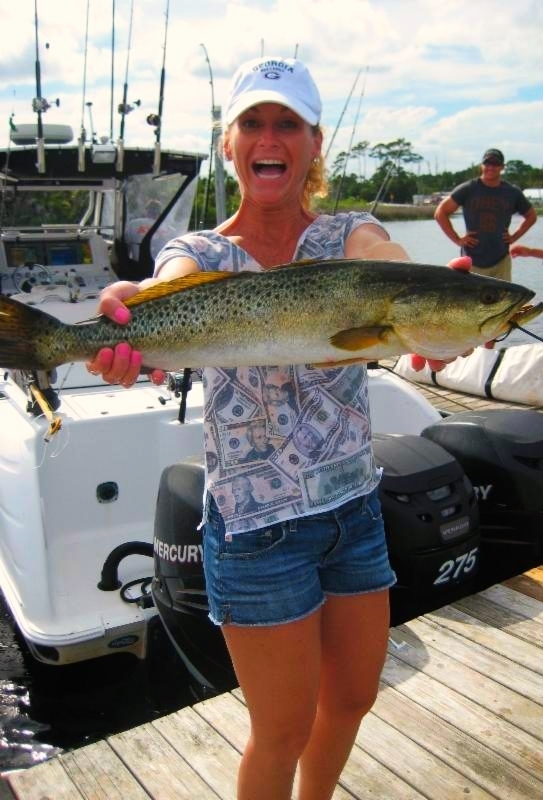 Trout have been a little more challenging because of the low salinity in the shallows due to rains, so the larger schools of trout have moved out to somewhat deeper water (4-8 feet). 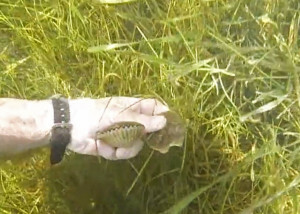 Larger solitary fish can still be taken closer to shore in the early mornings, especially if the floating grass is not a problem (which it has been much of the month). 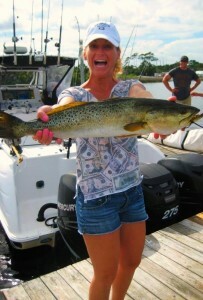 Megan Greer is excited about her gator trout. Jack Hiffenger and Mike Chavez with some beautiful kingfish taken during the Reeling for Kids tournament. Mark McKinney with a 6.9 pound redfish caught during the P&J Tournament. I had a great time at the Reeling for Kids tournament, fishing with Noah Brindise and Don Feers, with one our largest trout from day 1. 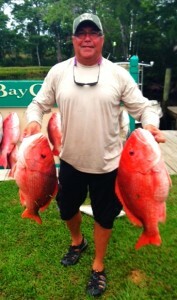 Perry McDonald landed this beautiful pair of red grouper. 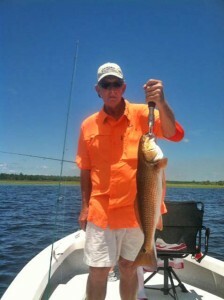 On day 2 I fished with Mike Moser who caught this overslot redfish south of the river. 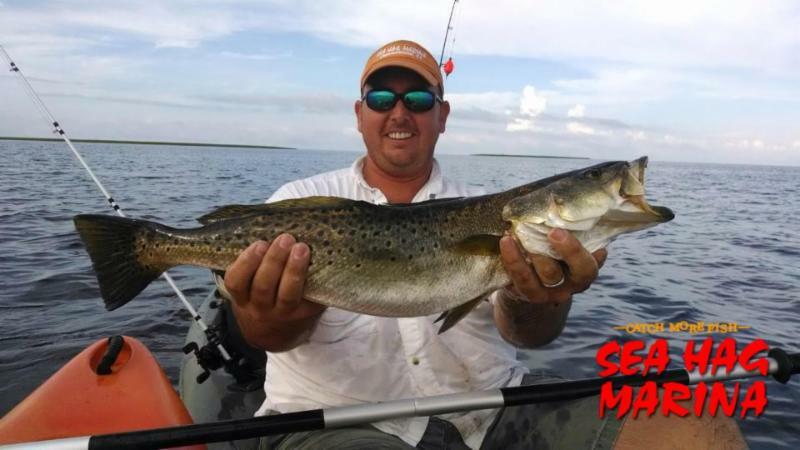 Dustin Philpott was kayak fishing near Rocky Creek and nailed this 28 inch trout. Shane Morris with a beautiful limit of upper-slot redfish. 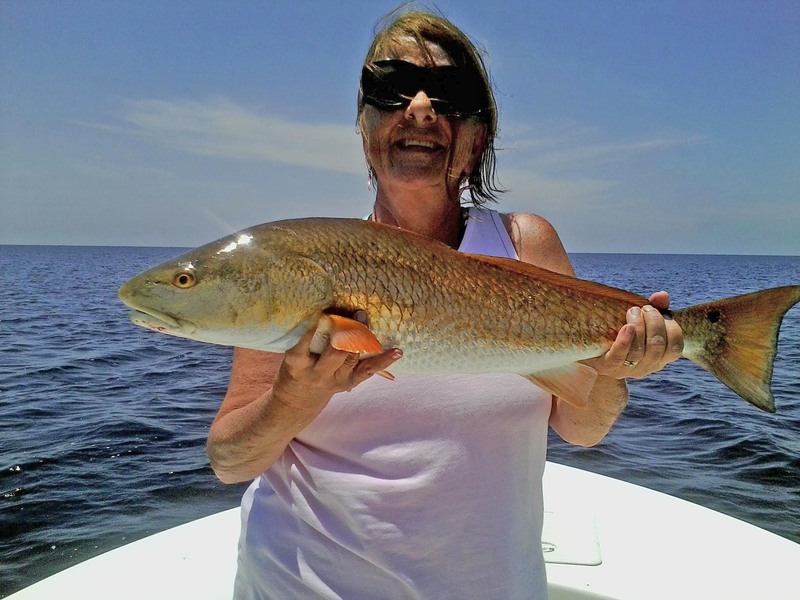 Julie Bennett took advantage of the short red snapper season. 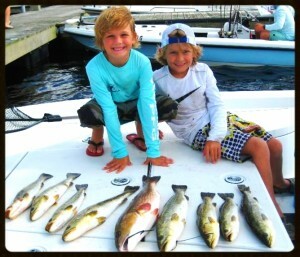 Trace and Logan with their excellent catch using live shrimp. 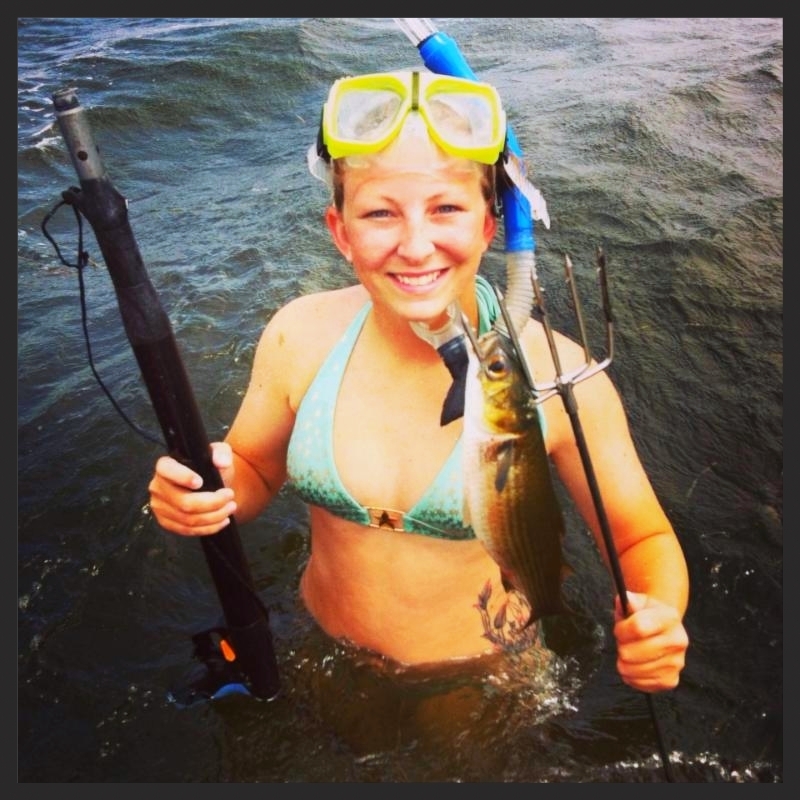 Sea Hag’s Anna Patterson has been finding some eating mullet while exploring for scallop areas. 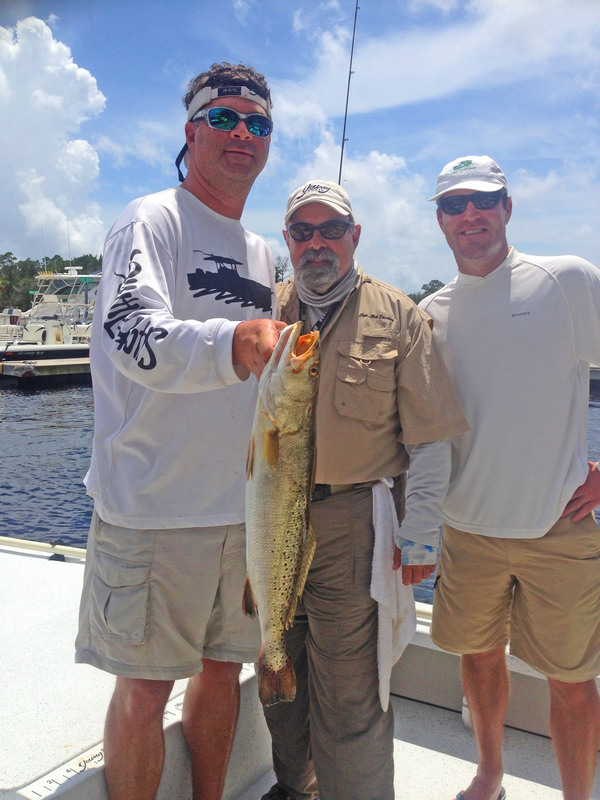 Bossmen Charlie and Chase Norwood found this gator trout in a foot and a half of water. Capt. Leiza Fitzgerald had to release this beautiful gag grouper last month….but this month it’s in the cooler for sure. Max Leatherwood took his talents offshore and red snapper paid the price. 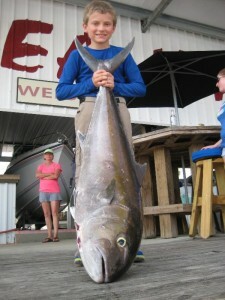 Michael Presley and a 50 pound amberjack taken at the end of last month. 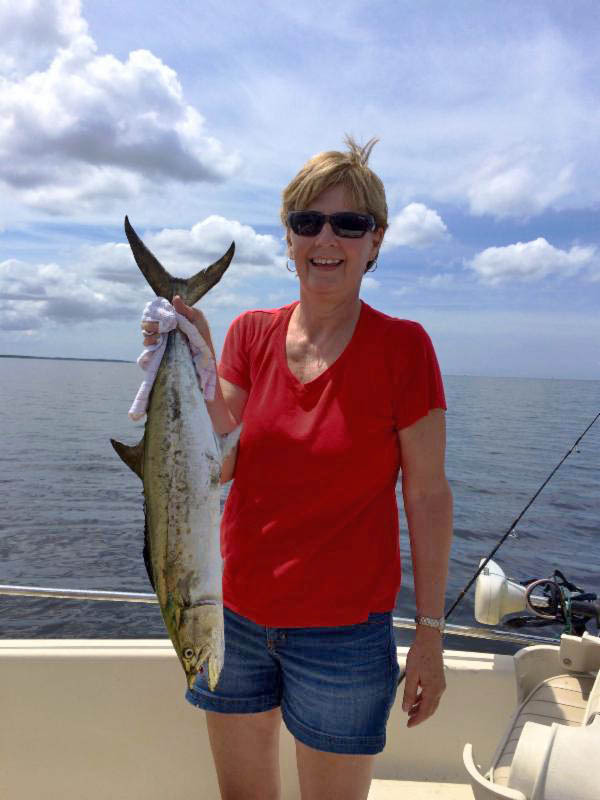 Marisa Sessions from Bell found this nice Spanish mackerel near some offshore sand bars. 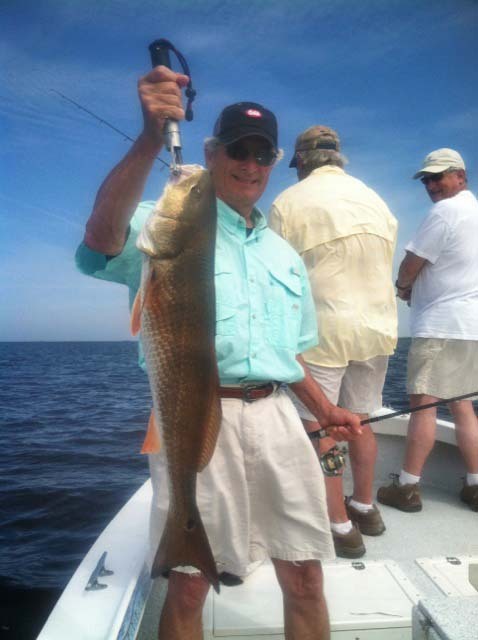 …and one from Florida Sea Grant that includes more specific information and gives you information about where you can obtain brochures and specific information about Taylor County. 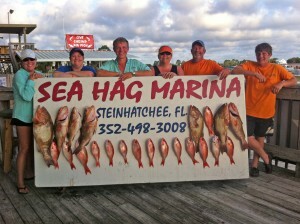 Because of the large expected number of scallopers, inshore fishing will require some planning. 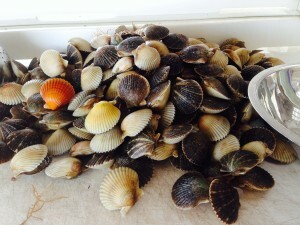 The fact is that scallops are most accessible after the sun is high; that’s when the bivalves move higher in the grass level. 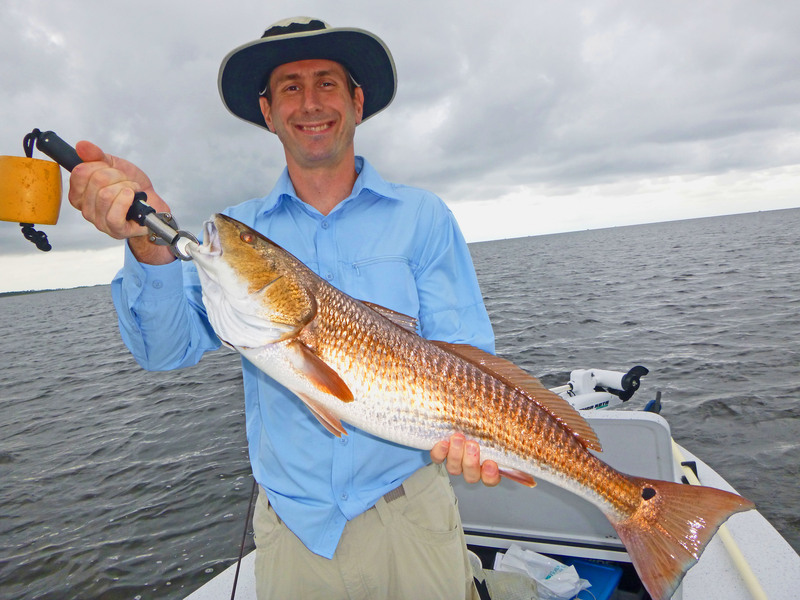 That’s an opportunity to fish very early in the morning, when the water is cooler and our inshore target species are more likely to feed. 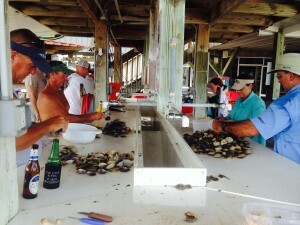 We try and get out just before sunrise and may be back in before noon, which is when most of the scallopers will just be hitting the water. 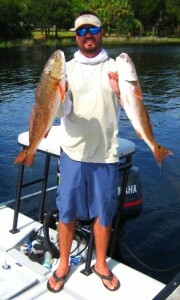 We can also expect an influx of sand trout. 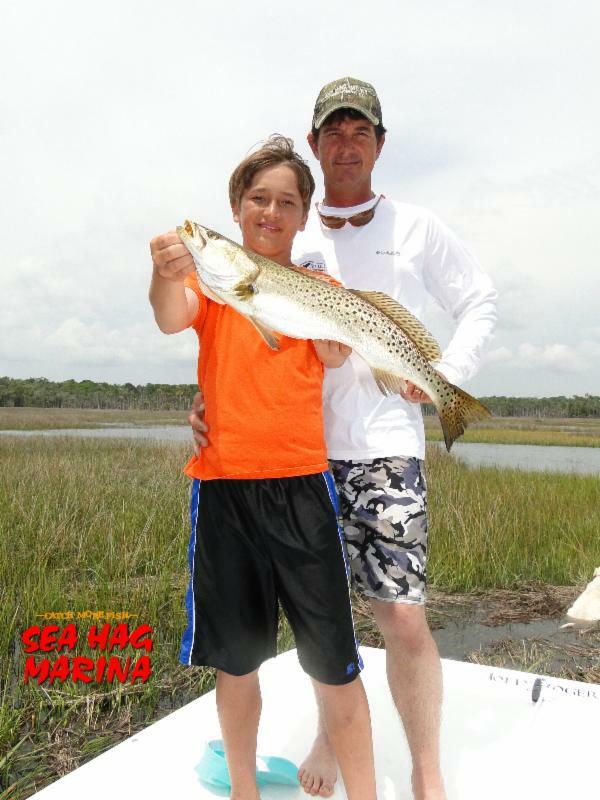 Last year was one of the best years in recent memory for these tasty fighters, who can be found around nearshore sand bars, up to 4-5 miles offshore, often mixed with spotted seatrout. 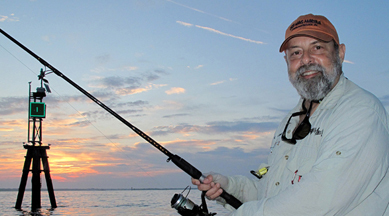 Fish with jigs tipped with Gulp or Stinky Fingers tails, and watch out for schools of whitebait and the Spanish mackerel and bluefish that will be giving you a big surprise when you least expect it. There is no size or bag limit on sand trout, and in my opinion they fight harder and taste better than spotted seatrout. 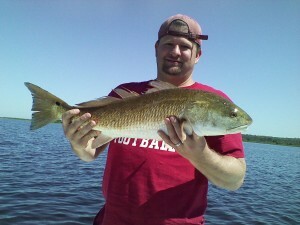 Good areas are around 9 Mile Bank, Little Bank, and outside of the Bird Rack north of the river. 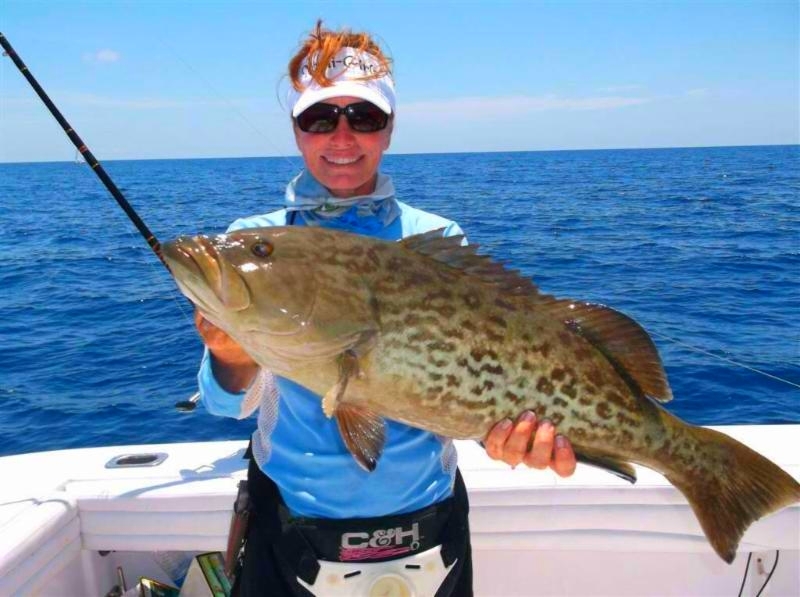 Offshore, with the opening of gag grouper season in federal waters, boats will be heading out to fish live bottom and structure. Dead Spanish sardines, threadfins and squid, all available at our Ship’s Store, will make fine bait for bottom fishing, but you will have a much better chance at locating and turning on fish by using some of our Sea Hag live pinfish. 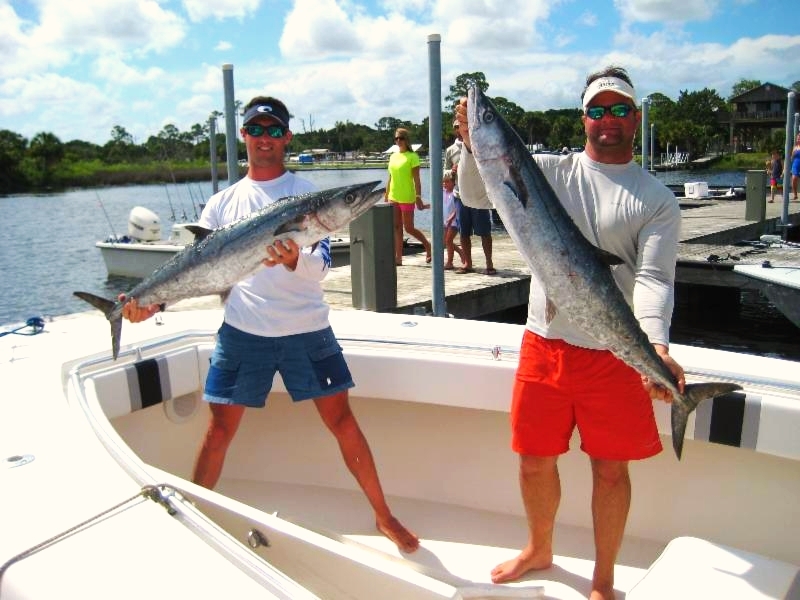 Because offshore structure almost always attracts lots of baitfish, there are very likely to be kingfish and cobia in the area, so always keep at least one live bait out under a cork, with a wire leader. 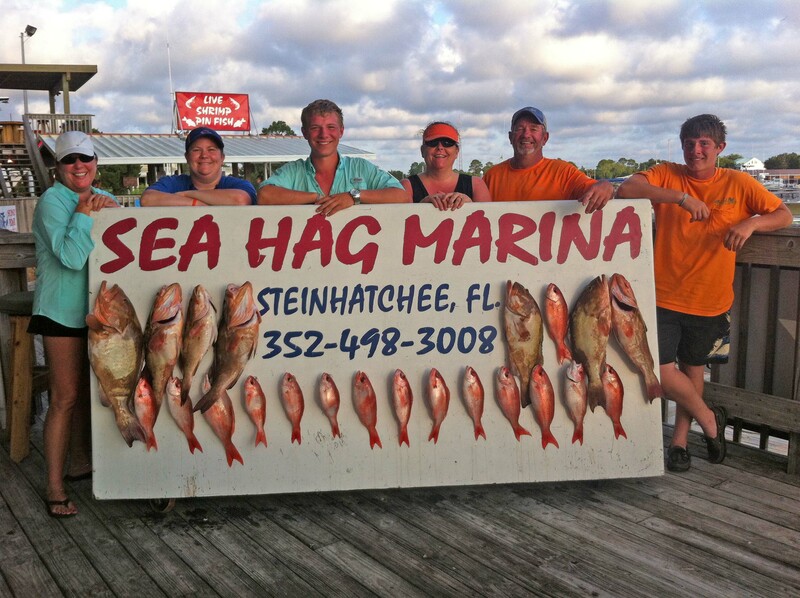 We also can provide absolutely everything you need for a family scalloping or fishing trip. 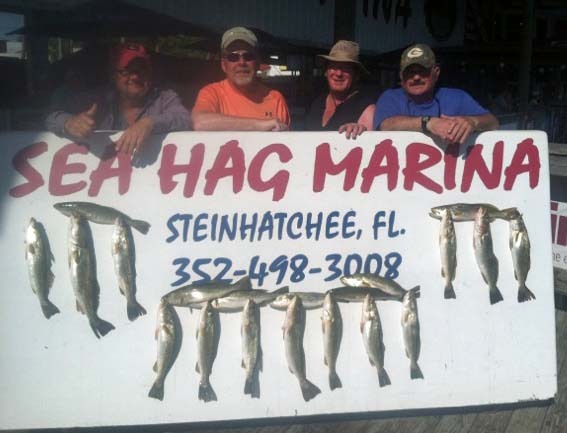 We’ve added more of our excellent rental boats, available at a very reasonable price, and we can provide scalloping gear, fishing licenses (needed for scalloping), live shrimp and pinfish, all the hot new lures and soft baits, and rods, reels and all the tackle you would need. Make sure you stop by the Ship’s Store for your needs, and we also have added a ton of new clothing lines. 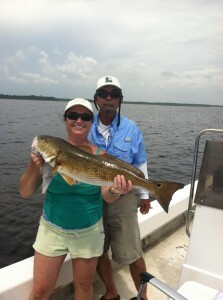 As expected June was a very good month for both redfish and trout fishing. 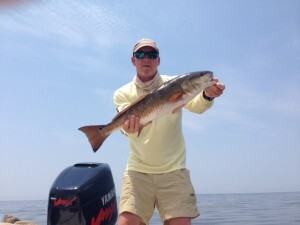 With water temperatures a little cooler than normal the bite continues to be solid with a strong bite of short trout and most days limits of keepers. 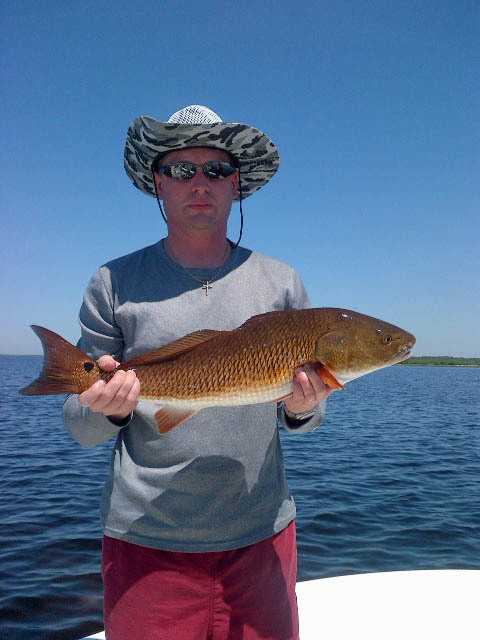 A variety of baits are working very well including live pinfish, cut bait, and gulp specially the light colors given the brown color of the shallower water we are experiencing. 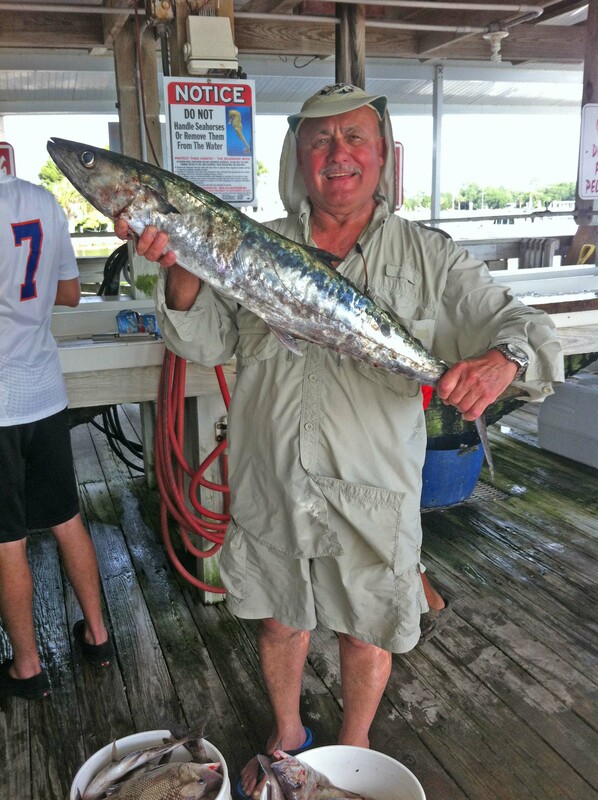 We saw a nice run of Spanish Mackerel this month and as bait begins to school up look for birds, a tell tail sign of some non-stop action. 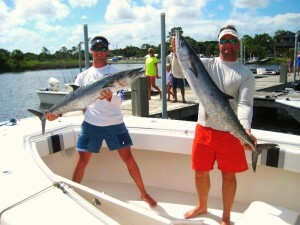 Expect the fishing to continue to be strong when the weather cooperates. Scallop season is around the corner and Steinhatchee is about to move into high gear as families from all over Florida and beyond will descend on the Nature Coast to enjoy some fun on the water and some tasty mollusks! 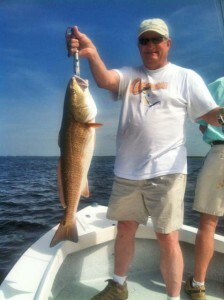 Hooked on Reds Charters is well equipped to get you out on the water and your belly full of scallops. If you’d like to join us we are ready when the scallops are! Call 386-208-3823 early as we quickly book up this time of year. Gag grouper season opens July 1st and the crowd yells… Yay! We have encountered gags from 25 out to 85 feet. 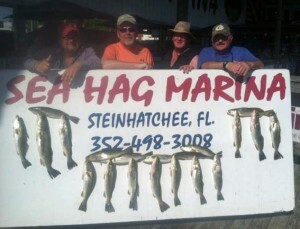 They have taken frozen, fresh cut bait and live bait of all sorts and one was caught on a piece of smoked chicken (no kidding). 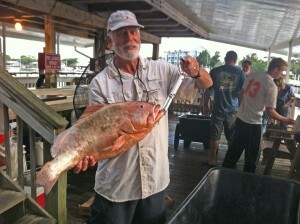 Which goes to say, you can’t even sling a dead chicken without catching a gag grouper. Enjoy! While grouper fishing, always setout a ‘Kodak’ pole off the stern baited with anything. 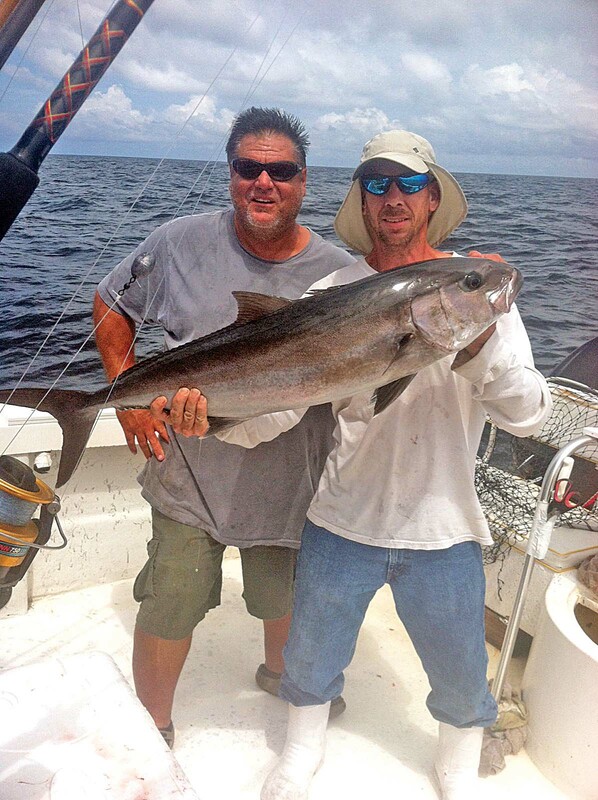 You’re giving yourself a chance to catch a smoker king, killer cobia, mango snapper or shark for minimal effort. I refer to that rod as Kodak because anything caught on it will be photo worthy. 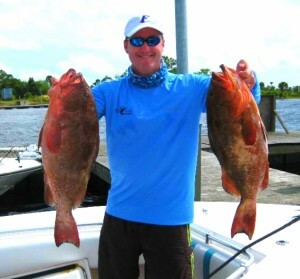 Florida snapper (white grunt) are running exceptionally larger, weighing more than 2lb. A thirty-minute to hour jam on light tackle will make for a wonderful fish fry. 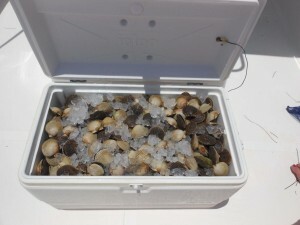 For bait think durability, such as squid and cut bait or mini marshmallows (no kidding). From Scalloping to Fishing, we do it all, need a trip, give us a call 877-852-FISH.